Wedgie's wonderful world: I'm forever blowing bubbles! So many bubbles in that bath.....I'd love to sink into all those bubbles with a glass of champagne and relax until I'm all wrinkly! I have complimented the bubbles with my lilac and white polka dot patterned paper. I have used my Promarkers and Stickles to colour the image and add a little sparkle. I love this pretty colour combo and thought it went well with my bubble bath theme. Thank you ladies - such a lovely surprise and much appreciated! Don't forget to pop by both Crazy 4 Challenges and Cupcake Inspirations to see the gorgeous DT cards that have been created this week. No, I did not know it was national bubble bath day but I wish I had! Fab card too. I didn't know either... Gorgeous card Wedgie, lovely image, fab colours and design. This is such a cute image and I'm glad to hear there is such a thing as bubble bath day! Love the sparkle you added to the bubbles. Aww, that is such a cute image! Great card. Thank you for joining us this week at Cupcake Inspirations. This is such a fun card - love the shimmery bubbles. 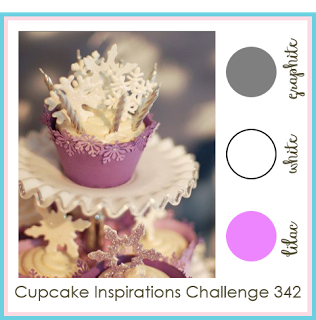 Thanks so much for playing along with Cupcake Inspirations this week! Deborah, DT Sweetie. This is so cute and fun! and I wish that girl in the bubble bath was me...!! You worked the colors really well in this happy card! Thank you so much for joining us over at Cupcake Inspirations!